Design of 'budget' iPhone to be mix of multiple devices? Rumors of a low-cost iPhone were only borne a few short weeks ago, but the whispers are starting to gain some steam, especially as more details seemingly emerge. Following a report from last week that contained supposed details on the iPad 5, iPhone 5S, iPad mini 2 and a so-called plastic iPhone, iLounge is back at it again with what it claims are some specifics for the lower-end handset. "Reliable sources" are saying the phone will be predominately plastic, and while we've heard that before, it also won't merely be an iPhone 3G or 3GS packed with Retina display or sparked by Lightning. Nor will it be an all-plastic cutout of the iPhone 5. Instead, this device will supposedly be a mash up of the 5, the fifth-generation iPod touch and the iPod classic. Yes, as in the music player from 2008. According to the publication's sources, the phone will be a hybrid: its screen will fall in the iPhone 5's 4-inch display, while its bottom will take a cue from the iPod touch. As for overall shape, the phone will look much like the iPod classic. 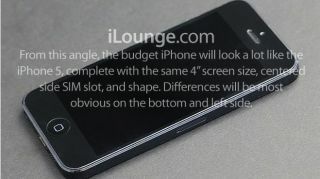 Here's where it gets weirdly specific: iLounge details how the phone will appear almost identical to the iPhone 5 from the front. The sensor, camera and button arrangement will be the same, though the screen will only have a resolution of 1136 x 640. Unlike the 3G and 3GS, the glass (likely made by Corning) will protrude ever so slighty as it does on the 5 and iPod touch. The phone is said to be about half a millimeter taller and half a millimeter wider than the iPhone 5 though it will be about a full millimeter thicker (you can totally feel that extra half). From the side, the phone will take its cues from the iPod touch and pre-iPhone 4 phones. In other words, no circular volume buttons but instead squeezed out, pill-shaped pushers. Aside from the materials used to make it, the housing of the new phone should be similar to the iPod classic in shape. The sides and back will be flat, unlike the "soft curves on all sides" found on the iPhone 3G and iPhone 3GS. This design element apparently allows the SIM card tray to sit in the center on the right side of the phone (like the iPhone 5's) while the buttons and ports are housed in flat surfaces. Flipping to the back, the phone will look like the iPod touch 5th gen with the camera, a circular microphone and rear flash featuring similar proportions. The lens, however, won't poke out. The bottom will be a mix of the iPhone 5 and fifth-gen iPod touch - there will be fewer holes than the iPhone 5 but a headphone port, Lightning port and bottom microphone will all call to mind the iOS 6 handset. A second microphone will supposedly sit next tot he headphone jack. According to iLounge, the phone won't be much of a departure from the designs Apple has already given us with the real shocker coming in the price, of which we still don't have details. Without official word from Apple, we can't confirm these details just yet, but sit tight. We doubt this is the last we'll hear of the less and less mysterious budget iPhone.